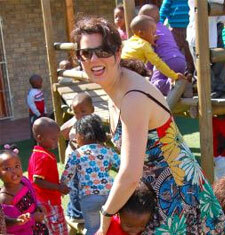 Amy and Jon Ostroff were inspired to start Love to Langa after visiting the Townships around Cape Town, South Africa in 2008. What simply began as an effort to do their small part by bringing family members and donating field trips, funds and goods to those less fortunate grew and attracted enough interest to prompt formalizing into an official 501(c)3 public charity in 2010. Amy’s career began in marketing and public relations for the financial services industry, but she had long stints in the nonprofit world, first as Director of Marketing and Communications for United Way in Nashua, NH and as Director of Alumnae at The Baldwin School in Bryn Mawr, PA. She also served as the co-president of the Parent-Teacher Organization at Stony Creek Elementary School in Blue Bell, PA for two years. Amy received a BS in Journalism from Northwestern University.